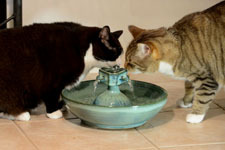 Are you aware of the beneficial effects of cat fountains? Many veterinarians now consider giving your cat a cat fountain to be the single most healthful thing you can do for your cat. Why? Cats crave moving water because in the wild, which cats still very much are, only moving water is safe. Still water can be lethal and cats are instinctively aware of this. This is why so many seek a dripping tap or want the faucet turned on or they stir their water with their paw or drink from the toilet, which often has slight movement of water. They need to see the water moving to feel it is safe. If cats don’t drink enough they become at risk for a variety of serious ailments. Although a cat can gain significant water from a wet or raw food diet, nothing is more likely to ensure sufficient water intake than a cat fountain. Most cats are attracted to the sound and sight of moving water and almost all cats will drink from one if given the opportunity. And water intake isn’t important only for its hydrating effect. the blood stream and into the cells, it moisturizes the lungs, regulates body temperature and helps eliminate waste products of metabolism through the kidneys and gastrointestinal tract. Cats’ water intake, when sufficient, contributes to elastic skin and a shiny coat. Signs of good health. 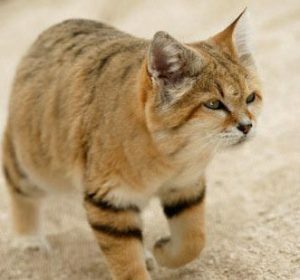 A diminished thirst drive that some cats seem to show may be due to having come, evolutionarily, from a desert environment but more often than not it derives from unattractive water sources, (ie., standing water in a bowl). If fed wet food, cats’ water needs will be much diminished but not entirely and an attractive water source is still advised for cats water intake to be sufficient. If dry food is a cat’s primary diet, a cat water fountain is even more vitally necessary. Learn more about cats’ water needs. What are the actual physical ailments that insufficient water intake can cause and a cat water fountain can prevent? There are several kidney and urinary tract diseases to which cats are prone, associated with insufficient water intake. One of the more serious diseases to which cats and other pets are subject is called Urethral Obstruction. Many cats are prone to a blockage in their urethra, the tube that carries urine from the bladder, which can lead to a very serious condition and can, and often does result in a painful death. The obstruction is a thick, pasty substance called Urethral Plug, or Matrix, but how and why some cats produce it is not known. It is thought that diet is a factor, as can be stress but what is known to prevent the disease is increased water intake. That is also part of the cure. 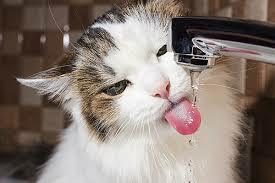 If there isn’t enough water available, or no attractive sources of water a cat may not drink enough. This leads to a very concentrated urine and it is in this that the matrix tends to develop. Sufficient water intake – ie., a water source to which cats are attracted and from which they’ll drink amply can prevent this. This is the primary role a cat water fountain plays. If your cat is nervous, distrustful or suspicious by nature, fill the fountain but don’t plug it in. Put it where she will easily encounter it. Leave it that way for a day or so, refreshing as necessary. Likely she will investigate and even begin drinking from her cat water fountain. When you do plug it in, have the pump on the lowest setting and take up all other water sources. Leave it that way for most of a day or so but if she is clearly not drinking, provide another water source. Then try it again. The idea here is to allow the cat to become comfortable with the presence of the fountain, then curious and interested. Most will. Once she is drinking from the fountain you can experiment with higher pump settings. Here you can view a variety of styles of Thirstycat Fountains with explanations of their differences, which nature of cats they are best suited to and why. Use the coupon code – mystery – for 10% off all purchases from our shop.